A Californian received a 12-centimeter goring to his right buttock and another runner suffered a slight injury. The third running of the bulls of the Sanfermin fiestas, with bulls from the Cadiz bull-ranch of Fuente Ymbro, was both thrilling and dangerous, especially at Mercaderes and the Telefonica stretches. At the second one, one of the bulls got left behind and it stopped and turned several times to charge at runners. One of the herdsmen slipped and fell as the bull charged him but, luckily he managed to get out from between the horns. The run was very fast, but this rear bull meant that the time lengthened to 3 min. 42 sec. before the rocket could go off to signal that all the bulls had reached the pens. Just one runner seems to have suffered an injury from the horns of the bulls. The Fuente Ymbro bulls from Cadiz came out of the pens in Santo Domingo at a very fast pace and, although the pack was tucked in behind the bell-oxen at first, the bulls gradually began to over take the bell-oxen. The pack remained compact as they crossed City Hall square, but once in Mercaderes three of the bulls moved ahead and they entered the corner to Estafeta at a fast pace. 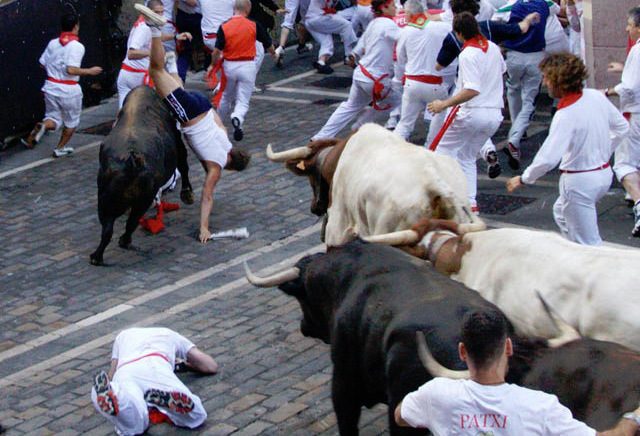 The first bull knocked down one runner and another runner near him was tossed by the same bull. However, both runners were able to get to their feet as the bull charged ahead. Just a little further ahead a small pile of runners formed and they were stepped on by the three leading bulls. It is likely that here one of the runners was jabbed by the horns of the bulls and this would seem to have been the only goring today. The other three bulls, which had been left further behind, started to catch up on the leading three when they entered Estafeta without slipping at the corner. In Estafeta there were lots of trip-ups and falls and some small piles of runners formed. The pack of bulls was now closely grouped together once again and it was difficult for the runners to find space to run in front of the horns. Nevertheless, some good running could be seen. At the middle of the stretch, one of the bulls moved ahead and the runners could get in close to the horns to produce some exciting running. The Telefonica stretch was the most complicated part of today’s running. One of the bulls got left behind and it made several attempts to turn back as it was surrounded by runners. One of the herdsmen, who was trying to reorient the bull, slipped up near the fencing on the left side and the bull charged him but luckily did not gore him. The other herdsmen reacted quickly and got the bull away from the fallen man and the other runners gathered at the fencing. Thanks to some skilful work from the herdsmen and some of the more experienced runners, this rear bull was coaxed little by little towards the bullring and, by the time it eventually was lead to the pens, 3 min. 42 sec. had passed in today’s running of the bulls. 14 running bulls. 5 goring. 61 traumatisms.